And now we get to the good stuff. Sure, the entire trip to Spain was good stuff, but the Basque Country has held a special place in my heart since I lived in the heart of San Sebastian during college. Ever since I have dreamed of the day I could return to elegant pedestrian avenues, tranquil bays and most important, the Parte Vieja, my old neighborhood that boasts more restaurants and bars per square meter than anywhere else in the entire world. The Basque Country has long been regarded as having the best cuisine in Spain and some even say all of Europe. I studied the resurgence and reinvention of Basque cuisine in gastronomy school and have been itching to go back. So this part of the trip was very exciting for me!! San Sebastian was the destination but we rented a car so we could visit more of the Basque Country on the way. It’s an impossibly beautiful land of mountains, forests, beaches, seaside fishing villages and remote mountain towns. First we detoured to Elantxobe, a fishing village precariously hugging a cliff in the northern reaches of Spain. We kept along the Basque coast en route to San Sebastian, visiting seaside villages where tourists seldom venture. Lekeitio is bigger and more visited than most and we stopped here to have a coffee and gaze out over the beaches and fishing boats at the ocean view. Then the highway widened, the cars sped up and San Sebastian’s elegant bay and cosmopolitan buildings unfolded before us. Our apartment for the next few days was smack dab in the middle of the Parte Vieja, just a few blocks from my old place on Plaza Sarriegui. Here’s the view from our balcony. San Sebastian is something of a mecca for food-lovers. The city boasts more Michelin stars per capita than any other city and in the Parte Vieja there’s a pintxo bar in seemingly every storefront. You’ll notice Basque words on signs all over town. It’s a frustratingly strange language with unknown origins and no relation at all to the romance languages of which the king’s Spanish is a part. Basque is a tangle of x’s and k’s and z’s and you’re not likely to pick up much if you stay for only a short time. But, if you learn only one Basque word while visiting this part of the world, the word to learn is pintxo (pronounced “peencho”). Pintxo = tapa. 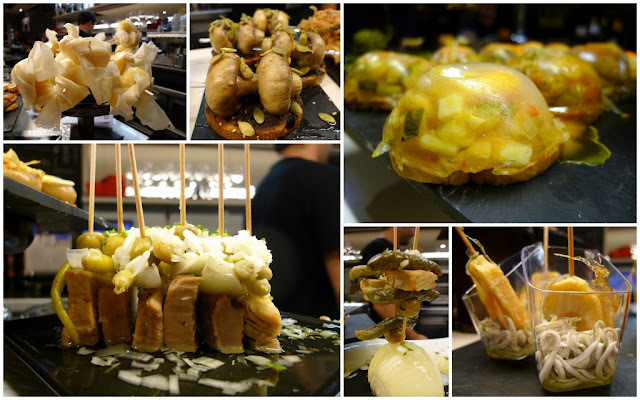 Most any pintxo joint you choose in San Seba has so much food displayed on the bar you’re likely to think you’ve died and gone to the best possible version of heaven, a land where succulent chorizos-tortillas-croquetas are available at every turn. But there’s a secret to dining in San Sebastian. Before dinner locals embark on what’s called a txikiteo, or tapas crawl, grazing on small pintxos along the way and enjoying a glass of txacoli (a local white fizzy wine), red wine or hard cider at each place they visit. Mastering the txikiteo is not as easy as you may think when you consider that every other first floor space in the Parte Vieja is occupied by a food establishment of one sort or another. You must do your homework, or inspect closely before you commit to a place. The best eateries don’t have hot finished pintxos laid out on the bar. Rather, the displayed items are usually dishes that can be eaten at room temperature (like tortilla or olives) or raw items the chefs will prepare to order (like uncooked croquetas or raw pimientos de Padron). Heaping displays of prepared foods are surely arranged in order to lure unsophisticated tourists, especially those who aren’t confident ordering off a Spanish or Basque menu. These are the people who just want to point and chew. Please do not be one of those people. So how does this all work? Without you even knowing it, the bartenders will be keeping track, slyly watching your every move, counting every olive you raise to your lips, every anchovy that slides off a baguette into your throat. When you’re ready to pay just grab a bartender’s attention and he’ll ring you up. To be safe, you might want to save your toothpicks and show them to the bar keep when you want to pay. He’ll count ‘em up for you and charge you per toothpick. On to the food! Just next to our flat was Bar Zeruko, where the creatively displayed items hint at the creative, molecularly gastronomic bent practiced by chefs here. … and it was here that we encountered one of the first… but certainly not the last… not even close… shall we call it, meat mishap? My vegetarian traveling companion had been warned that the Spanish may not understand her lifestyle and dietary choice. So far – and I’m talking on her first night in Salamanca – she had been offered a “vegetarian” salad full of krab (fake crab meat) and gulas (the “krab” version of angulas). At Bar Zeruko, which was certainly more sophisticated than the hearty meat-and-potatoes eateries of Salamanca, her sandwich “vegetariano” was stacked with cheese, pimientos de padron… and ham. And… tuna. When we asked the guy behind the bar what the deal was, instead of apologizing he faulted my friend for being vegetarian and suggested she should learn to eat meat. Pretty indicative of the general Spanish attitude towards vegetarianism. Those of us who consume creatures enjoyed poached lobster with parsley chimichurri and a mayonnaisy crab salad wrapped in ribbons of zucchini. Stay tuned for photos from the most epic txikiteo ever!